Mystery: is there a locomotive in Aquia Creek? It is a persistent story–in fact, almost conventional wisdom: that when the Federal army abandoned Aquia Landing in early September 1862, they left behind a locomotive in the muck at the bottom of Aquia Creek. At our History at Sunset program last night (127 on hand–a huge turnout for such a remote site)–it was again a topic of conversation among visitors. While I didn’t address the question last night, I did pay pretty close attention to the evidence surrounding it as I went through everything Aquia that I could find as I prepared for the program. What does the evidence say? Is there a locomotive waiting to be found at Aquia? I’m not certain how old the oral tradition is, but I can say that the first written reference to a lost locomotive appears in a college paper written in the 1970s. The author, who later earned his Ph.d. in history, not only asserted the loss but also speculated the name of the specific locomotive: the Athol. I went back and looked carefully at the sources he cited–largely the report of W.W. Wright, the efficient and reliable superintendent of the US Military Railroad during the 1862 Union occupation of Aquia, Stafford, and Fredericksburg. This is what he says. On Friday morning we got to work and attempted to load 3 locomotives on the Chancellor Livingston, but the load was too much for her, and she sank. However we got the locomotives off and pumped her out, and afterward put two on her, which she carried safely to Alexandria. In that sentence is the seed for the belief that a locomotive was lost and left behind: three went down, and only two were ultimately put on the refloated Chancellor Livingston for transport to Washington. But note clearly that Wright says “we got the locomotives off.” He goes on to say, “by 3 o’clock Saturday morning succeeded in loading all the locomotives, 3 cars, and all the movable railroad property at Aquia, except 57 cars. We left there Saturday afternoon, and the steamers arrived safely at Alexandria, where they have since been unloaded. Think about this: when Wright reloaded the Chancellor Livingston, of course he would not put all three locomotives back on board–three had sunk the boat before. So he put two back on, and loaded the other (along with four more) on other boats. 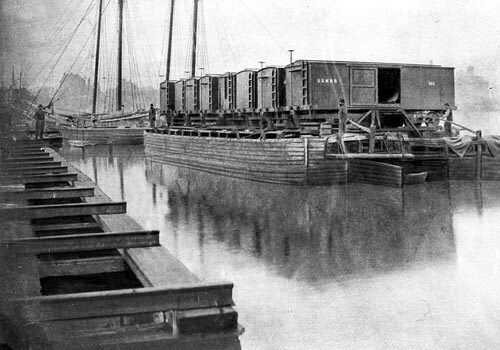 Railroad stock was transported to Aquia on barges like this, shown at the landing in 1863. The burning of the facilities at Aquia in September 1862 was a deed that provoked recriminations within the Union hierarchy. Many, including Wright’s boss Herman Haupt, thought the burning unnecessary, the product of undue panic at the time of evacuation. Consequently, there was a pretty thorough accounting of all that was lost, with some serious finger-pointing. In the aftermath, again and again, Union officers make reference to the needless burning of the 57 railroad cars, but, again and again, no one mentions the loss of a locomotive, beyond one that had to be abandoned on the tracks because it was inoperable. – The persistent belief that there is a locomotive at the bottom of Aquia Creek emerges from an understandable misinterpretation of Wright’s narrative. – In fact, no documentary evidence has yet emerged that supports the tradition that a locomotive resides in the muck. At the same time, it’s possible that the local oral tradition is derived from something else not embodied in pieces of paper. But, based on what I can divine from the written evidence, when the archeologists start their work at Aquia in the next year (under a grant the county just received), my guess is that they’ll not find the hulk of an engine mired in the mud. If I’m wrong, I’ll be the first to cheer the discovery and damn the dusty-book approach to history (and also contribute to the million-or-more dollar fund needed to raise and restore it!). 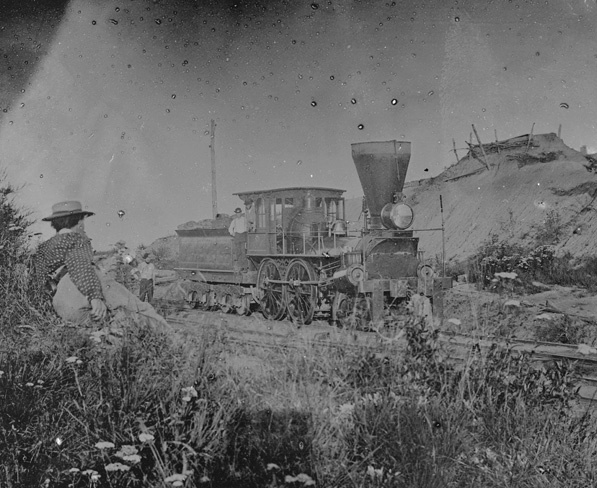 I believe this image is part of a series of photographs taken by Timothy O’Sullivan near Manassas Jct in the Summer of 1862. O’Sullivan had taken a photographs up and down the Va Central railroad from Cedar Mt to Manassas. But, if this image has evidence that it was photographed in the Aquia Creek area then, a greater amount of investigation is needed for the time General McDowell occupied Fredericksburgin the Spring of 1862 for other images. There are other photographs from the Spring of 1862 in Fredericksburg area. As a clarification, I just wrote about the first image of the locomotive with the fellow in the straw hat and not the second photograph of the railroad stock. Have you talked to your state archaeologist or a university about running a magnetometer survey of the presumed are of loss? The cost would be minimal, and it could go a long way to disproving the legend. We have a similar legend relating to Indianola, on Matagorda Bay, in Texas. Although there’s no engine, there is the boiler and some machinery from a steamship that burned there, which it seems is the likely source of the legend. Andy: A few weeks ago Stafford announced that it received a $77,000 grant from the American Battlefield Protection Program to do an archeological survey at Aquia. The project includes looking at underwater resources. It will be interesting to see what they come up with; the site is clearly rich in features, but with so much going on there during the war, I wonder if they’ll be able to make sense out of it. It’ll be fun to watch. The train at the old Austin Farms Restaurant was used to haul pyrite ore. Unfortunately, a nice story but it was not recovered from Aquia Creek.